Yesterday I was doing a little happy dance. I finished my first poncho. While I was stitching, I was a bit concerned that with it being so 'holey', it be decorative. Surprisingly, it is quite warm. A double bonus, great looking and warm. I still have to add buttons at the shoulders. Am thinking about some pretty mother of pearl ones, though it will depend what I can find locally. Information about the pattern and yarn can be found in post from last week. I have been looking for a scrappy project to work on this year. Something easy but also pretty. While browsing at Craftsy, I found the Inverted Star Tutorial. This free pattern makes a twelve inch block. The block is shown with white in the middle, where I have chosen to use a pastel. I'm still deciding whether I want to make more of these or search for a different block. The block and tutorial are by Jessscia Boschen. Afghan Sophie's Universe is coming along. I am almost finished round 41. I am very pleased with how this project is coming along. the instructions that the designer, Dedri, has posted are so clear and well illustrated. It may look complicated, though each row/round is quite doable. If you question whether you can accomplish this project, why not try the centre section and make a pretty table mat. Not to distract myself from Sophie, I purchased the yarn this morning for the second baby star afghan. Yes, the solids are the same as in Sophie. In case you can't tell, I really like teal. I'm thinking I might like to make another poncho. Have you made one, do you have a photo and or a link to a pattern. Leave a comment or link up with Mister Linky who is waiting below. I have no help or advice on crochet patterns. I simply sit in awe of your beautiful work, as always. I, too, am a teal fan, so love your colors on both projects. Lovely poncho, Heather!! I've been wanting to make myself one, but with all of my other projects I don't know if it's ever going to get done. I love your Sophie's Universe, too. It's gorgeous. Complicated, indeed! All of my Mary Maxim projects are at a standstill. I'm a few behind now because I haven't been pleased with the last several. It seems that I've had either problems with the yarn, the pattern or project as a whole. I haven't been posting about them because I'm frustrated. I should probably let them know, but I'm sure my complaints would fall on deaf ears. Sometimes the holes trap the air and keep the warm in maybe that's what is happening. I love all the fancy stitches and the color combo in Sophie's Universe. Love the Poncho, it looks really soft and warm. I really like Sophie's Universe. It's beautiful! Can I ask where you got the pattern? Would love to give it a try myself. 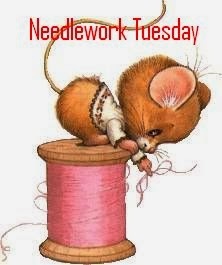 I'm a little late posting, bu my Needlework Tuesday finally made it at my place. I have a couple Ta-Da's to show off, hop over and check them out. Have a great day! !